This Creamy One Pot Butternut Squash Soup is so easy to make and it's the perfect comforting soup for fall! And it's healthy, dairy-free, and vegan too! Heat a large pot over medium heat. Add the olive oil. Add the onion, garlic, ginger, salt and pepper, and thyme, and saute until the onion is soft and transparent. Add the cubed butternut squash and toss in the onion mixture. Add the vegetable stock and stir to combine (You might need to add a little more or less stock, depending on the size of your squash. The liquid level should be just slightly lower than the squash). Add the lid to the pot and bring to a boil over medium-high heat. 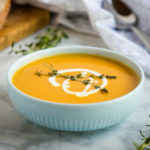 Once the soup reaches a boil turn the heat down to medium-low and simmer for about 20 minutes or until the butternut squash is very tender when you pierce it with a fork. Remove the soup from the heat and add the coconut milk. Puree with a hand-held immersion blender, or puree in batches in a regular counter-top blender. Serve immediately with a garnish of fresh thyme and some coconut cream or yogurt, or store in airtight containers in the fridge or freezer.